Motivation means “the definite and positive desire to do things”. It is part of the role of the manager or mentor to establish what motivates their apprentices, to encourage them to do well and develop and progress. 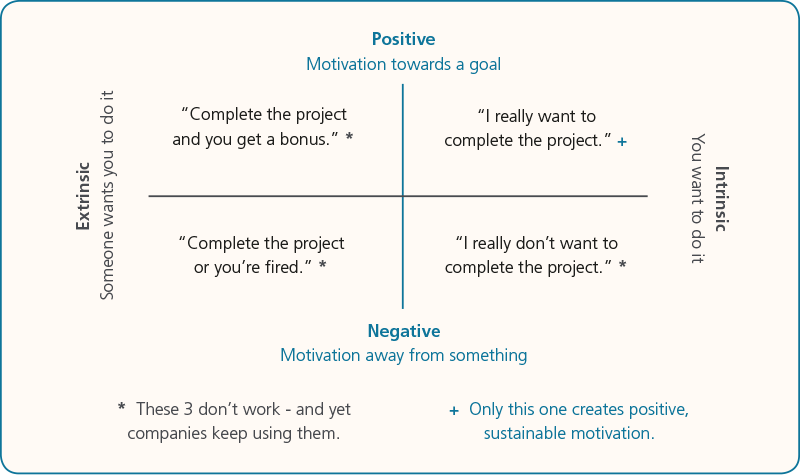 The theory behind motivation is well researched and documented and includes the idea that motivation is influenced by both intrinsic factors (such as thoughts, feelings and personal experiences) and external factors (such as how they’re treated in the workplace and how supported they feel). What is motivation made of? Business thinking is essentially economic; that is, it sees enlightened self interest as the primary motivational force. We work hard because we want to succeed. If we work hard we will get what we want – goal seeking leads to success. Some researchers disagree and suggest that there are a whole range of motives, some irrational, that cause motivation. Research tells us that motivation brings different rewards, for example, the motivation for achieving something at work is success. Some define motivation as being about the context, others that it comes from someone’s personal drive which might be to pursue excellence and be the best in their field, be competitive and win, want to make a lot of money, or just having a good old plain work ethic! Others believe that motivation is all about self determination and is intrinsic. Intrinsic motivation is when you want to do something. Extrinsic motivation is when somebody else tries to make you do something. Mentoring skills help with the intrinsic. The next section looks at how, as a mentor, you can increase your apprentice’s motivation levels.